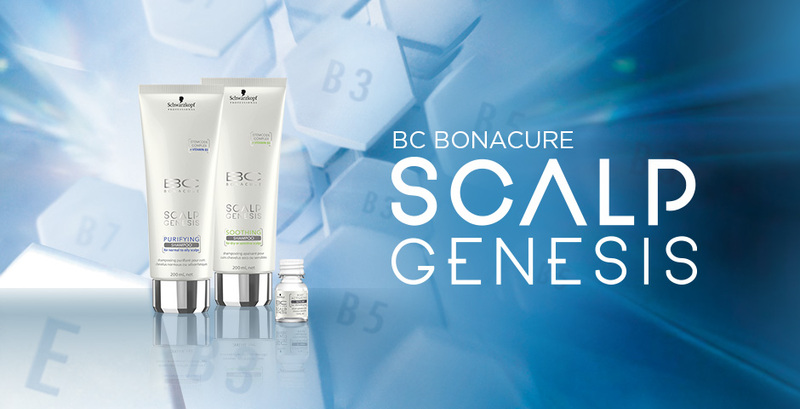 Detox, volumize and refresh your hair with the Schwarzkopf Professional BC Bonacure Scalp Genesis Soothing Shampoo, a re-balancing scalp system that improves the texture and density of your hair. Tackling scalp irritation and dandruff, the Schwarzkopf Professional BC Bonacure Scalp Genesis Soothing Shampoo is tailored to itchy, flaky scalps in need of relieving tension and calming inflammations. Enriched with superior technology that targets both the scalp and bulb metabolism, this vitamin-boosted formula deeply purifies and restores your scalp’s protective barrier as you cleanse your hair. The infusion of vitamin B5 soothes and balances the oil secretions in your scalp, whilst added hydrolyzed keratin leaves hair hydrated and repaired. The Double-Action StemCode™ Complex protects your hair’s growth phase, whilst defending the root against oxidative stress, reducing any scalp imbalances for restored comfort. Massage into wet hair, rinse thoroughly then follow with your favourite Schwarzkopf Professional conditioner.